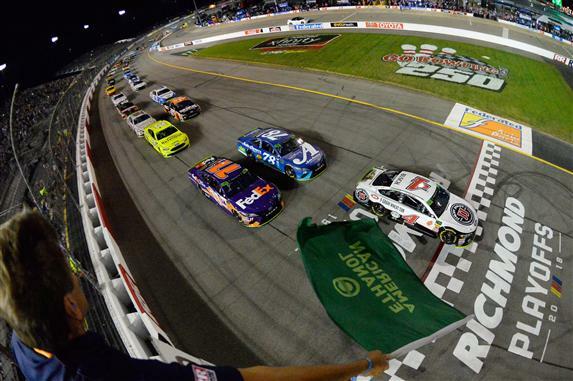 Short track racing under the lights returns to the MENCS this week as the cars will compete at Richmond Raceway. This track is a .75-mile D-shaped, flat track which usually produces some exciting racing. It is always better under the lights too. The Toyota Owners 400 is scheduled for 7:30 p.m. ET on Fox. *There will be a post-qualifying inspection Saturday afternoon (1 p.m. ET). Any driver that fails will lose their starting spot and will start from the rear of the field Saturday night. If any of my picks fail inspection, I will post new picks before the start of the race. Kyle Busch (6): Busch has been on fire and he must be in all lineups this week. He has won 3 of the 8 races, has finished every race in the top 10, led 498 laps and has a 3.4 average finishing position. Busch has 6 wins, including 2 in a row and has finished 77% of his races at Richmond in the top 10. Busch had the fastest car in practice and he should win Saturday night. Martin Truex Jr. (8): Richmond is one of the best tracks for Truex Jr. He has led at least 120 laps in 3 of the last 4 races at Richmond. He has also scored Stage points 7 of the 8 Stages. He swept the Stages in the last night race at the track. Truex had one of his best runs at Phoenix (similar track to Richmond). The No. 19 team said they set their car up for the night so hopefully this race does not get moved to Sunday morning. Kevin Harvick (7): Harvick won the pole for the race Saturday night and he will be hard to pass up front. Many of the drivers said Harvick had the best car at Bristol but he was trying to get his laps back the entire race. It looks like the No. 4 is fast again this week. Harvick has finished 5 of the last 6 races at Richmond in the top 5. With the No. 1 pit stall and No. 1 starting position, Harvick should have a good chance to finish up front this week. Joey Logano (5): Richmond ranks as the 3rd best track for Logano. He has a series-high 5.25 average finishing position and led the 4th most laps at the track over the last two seasons. His practice times were not very fast but I would not worry about it. Logano is Mr. Consistent at Richmond. He always finishes up front here. I will use another allocation with the No. 22 car. Kurt Busch (9): It would not surprise me if Busch won the race Saturday night. Some teams in the garage were talking about how fast his car was. Also, Chip Ganassi Racing took two pit crew members off of Kyle Larson’s team and gave them to the No. 1 team. They did this to improve the No. 1 car on pit road. Busch has a 9.1 average finishing position in the last 9 races at Richmond. He should easily finish in the top 10 again Saturday night. My Garage Driver this week will be Denny Hamlin (8). He had a very fast car in practice. Hamlin said he would have qualified up front if he did not draw the last spot in qualifying. His team was at a disadvantage since all of the speed was taken out of the track by the time the No. 11 car made a lap. Hamlin has finished every race this season in the top 11. He has finished 3 of the last 4 races in the top 5. This is one of Hamlin’s best tracks so I will have him in the garage this week.